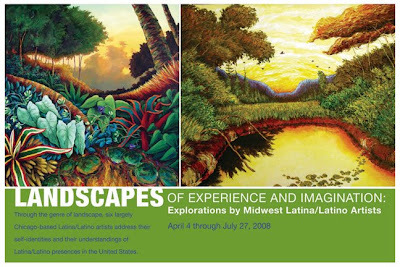 This exhibition highlights and explores the ways that eight, largely Chicago and mid-west based Latina/o artists have developed the theme of landscape through mixed and new narrative media installations, as well as through more traditional means of drawing, painting and sculpture. 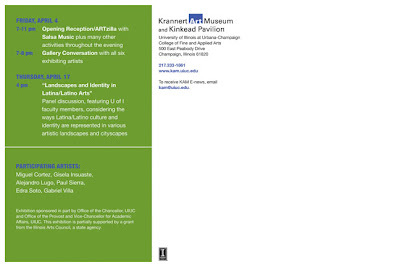 The exhibition examines their responses, through a variety of pictorial forms, to the natural and built environment. The works included will address the memories or imaginings of a tropical forest, the suburbs, or the density of urbanscapes, as well as the artists' own self-identities, or understandings of Latina/o presences in the United States. This collection will present a broad range, "from the rich, expressionistic painterly work of Paul Sierra to the conceptual performance-based work of Miguel Cortez."